I honestly cannot believe that 3 years ago I was receiving my results and preparing to go to Uni. I've had an amazing 3 years and I'm so lucky to be able to have 1 more year left! Now I know that if you've just left sixth form/college you'll be waiting for your results tomorrow and I know most of you will be worrying about the fact that you don’t even know if you are going to uni yet, but despite feeling sick to my stomach, I was SO excited to get all of my uni stuff together and buying things for my new uni room. I wanted to have my room all matching with lots of cosy blankets and cushions so that it felt as homely as possible. It's a scary thing moving out for the first time so I wanted to make sure I had home comforts as well as all the essentials. 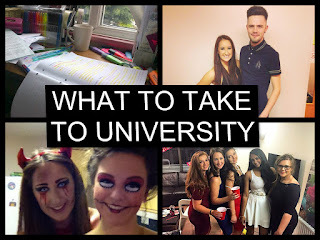 I thought I'd help some of you out and share with you all the things that I would put on my "What to Take to University" list! I only bought my essentials from places like Wilkos, the Range, Primark Home section, Ikea, Matalan etc. It's not worth spending loads of money as things will likely get broken and you'll want to change how your room looks each year. Many stores nowadays offer student packages where you get discounts if you purchase a full dinner set etc. What are you planning on taking to uni? If any of you are due to get your results tomorrow, then a massive good luck! Also a quick shout out to my brother who's getting his results tomorrow too - Good Luck! Great tips! I wish I had a list like this when I went to university!